This provides the UK higher education sector with an opportunity to develop and implement appropriate and implementable solutions. We are seeing the Government providing indications that is looking to see “business-friendly solutions” being developed. Ed Vaizey, the Communications Minister, has suggested that the EU directive is “a good example of a well-meaning regulation that will be very how to buy antibiotics online uk difficult to make work in practice“. Perhaps this is an example of Government policies being in alignment with those working in higher education who wish to continue to make use of Web technologies to deliver a wide range of services. Whilst my initial reaction was that this should be something dealt with by the browser too – I’ve since tried to think a little more around the complexities of this. One of the things that the legislation is trying to address is that there are different uses for cookies – some of which reveal more personal information than others. By contrast, current browsers allow only one type of automatic filtering: for third-party cookies, which is fairly crude and can be gotten around by websites proxying cookies for third-parties anyway). The only alternative is an “ask me” option, where the user has to make a decision about each and every cookie via a not-very-informative dialog box which interrupts the viewing of the page and soon gets annoying. 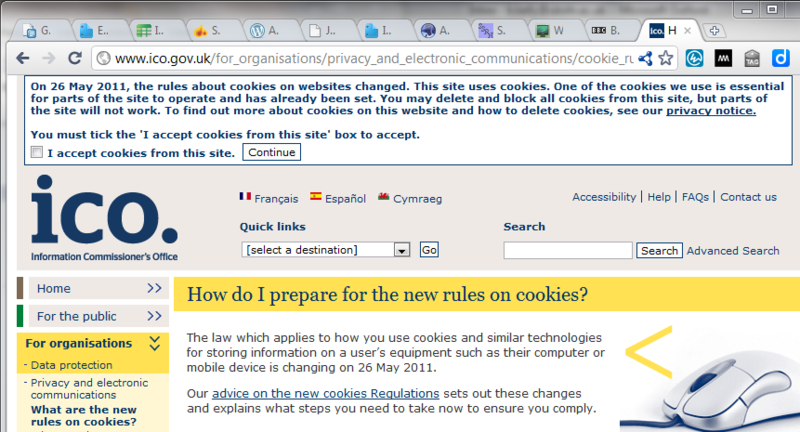 So it does kind of make sense for websites to provide a little more information about how the cookies will be used. Typically this has been done via privacy policies – but no-one reads those. The alternative suggested by the ICO is for a bunch of text which the user should read and agree to before a cookie is set. This is the most comprehensive – but still not the greatest experience (no-one wants to have to read that much before using basic webpages). Mozilla have started to explore how to codify different uses of private data via a set of icons: http://www.azarask.in/blog/post/privacy-icons/ – but that’s still work in progress. Alternatively, perhaps there should just be some reasonable set of rules about how data should and shouldn’t be used (eg no sharing with third parties, max retention limit, etc) – and then we wouldn’t need to ask the user at all. That would, however, cause a lot of trouble for the online advertising industry. Today we’re publishing an updated list of the main cookies in use across BBC Online and what each is used for. It also tells you how you can control cookies by setting your computer, mobile or other device to notify you when a cookie is issued, or to opt out of cookies altogether. It strikes me that there are many parallel with Web accessibility. When SENDA legislation came into force there was a feeling that this meant that there was a legal requirement to enforce WCAG conformance – despite the fact that in 2003 only 3 University home pages conformed with WCAG AA and in 2004 this had only risen to 7 – see findings. We subsequently learnt that WCAG simply documented a set of technical guidelines – and that these guidelines were flawed an not universally applicable. In addition we discovered that the emphasis of the accessibility of the digital resource was misplaced – various guidelines could not be implemented if non-UAAG browsers were used. We needed a more realistic approach – and we have seen that in last year’s release of BS8878. I think we need to avoid repeating mistakes made in the past. Let’s look at what realistic approaches may be deemed appropriate (and the Government has hinted that this is an approach it favours). And also lets explore which approaches can be taken beyond the Web site – such as providing user education, encouraging use of browsers which support privacy standards and providing policy statements in machine-readable formats. I’ve been having a look at the legislation and guidance with my maths graduate hat on (the law graduate hat is lying down in a darkened room!) and my current theory is that there are three classes of cookies – those without which the site won’t work, those that are mainly “for” the user and those that are mainly “for” the server. I think/hope the first two of those are relatively straightforward to achieve compliance, but the third one is a lot harder (as the ICO site demonstrates). Draft analysis is on my blog, and comments (and counter-examples) would be very welcome. It’s a very long time since I was involved in the nuts and bolts of web servers (P3P is still a promising new technology, as far as I remember! ), but feel free to get in touch if it would be useful to compare notes. The ICO has provided some extremely clear guidance, both in general and specifically about current browser support (i.e. far from good enough to support the Directive). They even say that sites shouldn’t feel compelled to copy their implementation. It would probably be a mistake for almost anyone to do anything relating to third-party cookies until Google actually make a statement about the effect this legislation will have on Google Analytics. I think only two EU countries have implemented the full Directive, so it would be interesting to see what they’ve done with these kind of tracking services.